I bought my Regner Vincent secondhand, three years ago in 2011. It was not in great condition – the lower buffer beam timbers were broken off, one gear was badly worn and the chain was very slac , with no adjustment left. But I like a project, so I quickly had it running – with a few lessons partly learned. and a lamp bracket bolted to the chimney. And so, after the initial videos were made, Vincent mostly stayed in the cupboard with only the occasional outing to double head for speed control (he is very good at that!). In the process of modification (scroll down for the story), I have learned a lot more about the loco and its parts, so I am going to deal with some of those lessons first, as they apply to all Vincents (I think!). The Regner gas filler valve is a serious bit of kit, heavily engineered (see below right), and needlessly difficult to use. Strangely, I managed for the first couple of years using a small piece of silicone tubing on the end of the gas adapter (to make a slight seal round the filler) and by leaving the gas control valve slightly open. When the tank is full you can hear the gurgle and the job is done. This year, try as I might, I could not do it reliably. There was gas everywhere but in the tank! Now life genuinely is too short to fight with this valve, and replacements, fitted with the infinitely superior Ronson valve, are cheap and a simple swap. I got mine from Chuffed2Bits (see below left) in the UK and am well pleased. One day, while opening the valve before lighting up, I felt a cool breeze on my hand. There was a serious leak from the gland and investigation found no trace of an O ring or sealant. Luckily I had a tiny O ring in stock, but I imagine that a whisp of PTFE tape would have done the job. The burner is noisy and can be tricky to light. I made a simple air control ring and have this covering about a third of the air holes for normal use. The burner is easy to remove and is a short tube, crimped at the end and with holes drilled. As it is so noisy, I tried wrapping it in Nichrome mesh. This formed a loose tent that glowed bright red in use and would have been excellent, but for the fact that the burner kept flashing back to the jet. As a result I had to remove it. Smokebox breathing is of crucial importance to this burner. During my modifications I covered the holes in the sides of the smokebox saddle. Bad move! The burner became a nightmare to light and so I had to drill the cover plates to restore the air flow. Another way would have been to drill the footplate to allow more air in from underneath. In dealing with the slack chain, ignorance led me astray. First I was puzzled about why the idler wheel was in front rather than behind the others, as in the photo in the instructions. Had it been modified? The answer was no - this arrangement just makes it a later model. 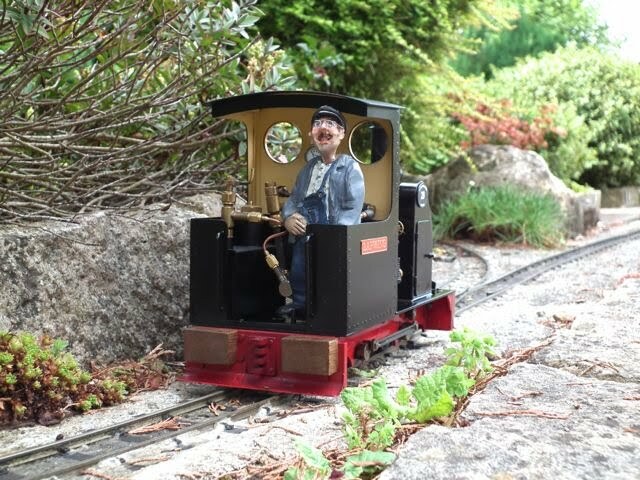 Then I concluded that the idler wheel was too small and so made a bigger one – and felt very pleased with myself – until I mentioned it to Martin Howard (of Martin’s Models in the UK) who told me to simply remove a couple of links from the chain! I have now discovered that there are a couple of other factors to check first. 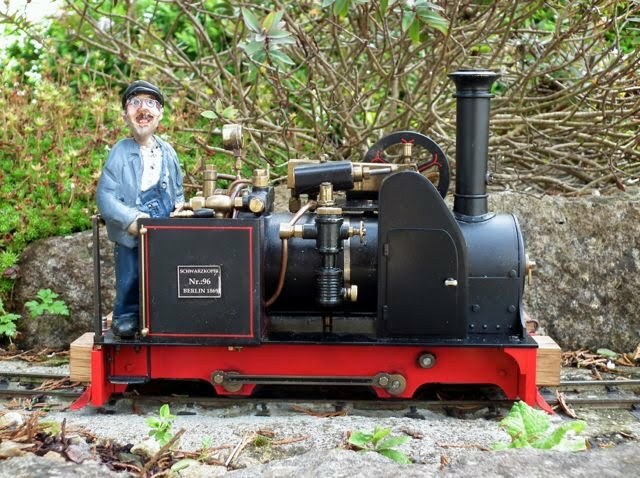 The boiler is held on with two small nuts, underneath the footplate, and these can have some sideways movement, so check the boiler is central, and tight. The other is the motor mount on the boiler. Check that it is central and tight before making other adjustments. It is a fact that the chains do stretch, so if you are at the end of the adjustment and all else is fine, then remove a link. And don’t have it too tight – there needs to be a little slack. Update: Since writing this Ron Tremblay in the USA has shown me another simple solution. He just unbolted the idler wheel assembly and moved it down so that it is only held by the bottom bolt and can be swung out as far as necessary. Now I would have thought it would move easily and slacken, but Ron reports that it has worked just fine for a year or so - so it is one to try! Here are a couple of Ron's photos the left one is standard and the right one with the mod. The Regner piston is the double cup type made from PTFE. I had a serious running problem and convinced myself that the piston was worn. When I removed the cylinder, I thought that the lack of compression (quite unlike an O ring piston) bore this out. Martin Howard was very helpful, but did not have one, and urgent requests to Regner went unheeded. Jason Kovac of The Train Department in the US did have one though, and it, together with new springs, were with me in a few days. I do not recommend taking the cylinder apart. The idea of using the piston to force the cylinder end out just didn't work. In the end I used strong craft knife blade hammered into the crack to lever it out. The brass is soft so it took some fettling to repair it. The new piston was exactly the same as the old one - no compression - and clearly they swell a lot when hot and wet. In my case, this was not the problem at all. The loco would run backward but not forward. The crank pin was loose and in forward gear, the big end unscrewed the pin and jammed it against the bearing bracket! As I mentioned at the start, some parts were missing when the loco was purchased secondhand, but I made do with the wooden beams for a couple of years. 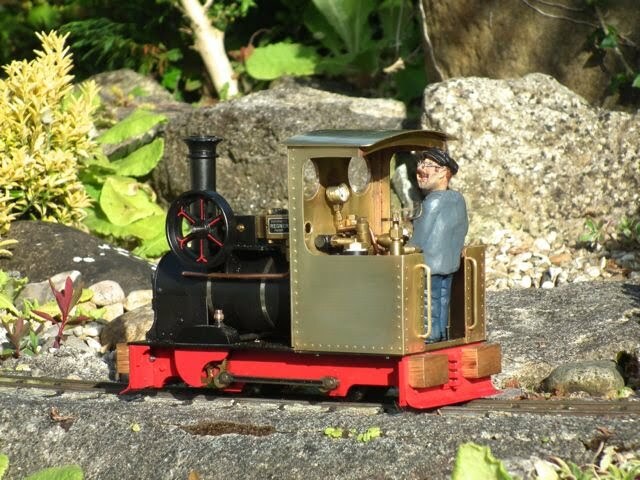 It was really the fact that I had made some thick brass ones for my PPS De Winton that made me think of doing the same for Vincent. I like the idea of a curved slate scraper and wooden dumb buffers and decided to have a go. The easy bit was cutting some 6mm brass with the chop saw (goggles essential) and filing it to shape. The more difficult bit (and I made it much more difficult) was fitting it to the chassis. I decided to make it fit flush to the chassis and that meant that I had to mill slots to clear the bolts that hold the chassis together, and mill a recess for the footplate. At the rear I found an easier solution. Now I do not have a milling machine, so I set up the vertical slide on my Myford and just about managed. The scraper was made from 15mm OD copper water pipe, split lengthways and then filed and re-bent to shape. It is fixed with two small head 8BA bolts. The quadrant trims at the ends are just soft soldered. This was all rubbed down, degreased with thinners and then etch primed with Upol Acid etch. I used an RWM Steam, multi height coupling and then sprayed all of the parts with Ford Radiant Red. The dumb buffers were cut from oak on a chop saw and tidied with a bench sander. (beware dust). The 8BA studding is superglued in. This holds but I will be wary when picking the loco up. When it came to the rear buffer beam, some weeks later, I decided to avoid the milling and just made a spacer to accommodate the bolt heads. Also, i made cut outs for the rear stanchion nuts - as at this stage I had no idea what I was going to do for the cab. Here you can see the spacer. The top of the buffer beam is chamfered to clear the footplate. I decided that I wanted to cover up some of the workings - as if perhaps a Health & Safety inspector (many years before his time) had paid a visit. My design process is totally freelance and doesn't even involve the back of an envelope. I draw straight on to the brass and make it up as I go along. I was lucky though, I found that K&S brass strip that was about 24mm wide and 2mm thick. Cut to length (in this case with a slight overlap at the front) it made perfect running plates. I then decided that the gear covers should have a slightly 1930's Art deco look and drew them up on the brass using a 1p coin to get consistent radii. Then it was a matter of hacksaw, file and shaping on the bench belt sander. I certainly didn't pick the easiest way of fixing it - but the photos will give you the idea of my approach. The large radius on the lower cover is made to be slightly larger than the throw of the flycrank and the oiler was from my scrap box (someone else's project) drilled and soldered on. The running plate is fitted with two 8BA bolts into holes tapped into the Regner running plate. The chain cover was made in the same way, though I ended up with a less than smooth join which required attention with files and emery. I did contemplate rivets - but then dismissed the idea as too much hassle! Above the running plates, I used satin black acrylic car spray as this doesn't get too hot. Below the plate I used red. These were completed before the rear buffer beam and this is how they looked. The jury was out on the chain cover! The jack was from Whitegates Engineering, intended for 16mm scale. I opted for dummy hinges so I silver soldered them to a rod, and, at the second attempt, they looked OK. I then drilled and riveted them to the door - and, as I didn't have a rivet snap, they got a bit flattened, but look OK to me. After making the door, I happened, by chance, upon a photo of a Victorian Drummond loco with a flared smokebox front (I have since remembered that Caledonia on the IOM has this feature too. So I drew it on the brass until it looked right and then cut and shaped it. To blend this in, and cover the holes in the saddle, I made brass plates with dummy rivets to bolt on. One has two bolts as I missed the metal saddle first time. The holes in the saddle are threaded 8BA. It was only when I tried to run it that I discovered that the holes in the saddle are essential for breathing and re-opened them. At this stage I decided that I was definitely unhappy with the plain chain cover and so, after considering mounting the nameplate there, or commissioning a nice big makers plate, I opted for a simple inspection door, silicone glued on. I wanted a cab - but I had no idea about the design, so I spent a bit of time thinking about it. I did think about modifying the existing one, but then thought it would be easier to remove it. 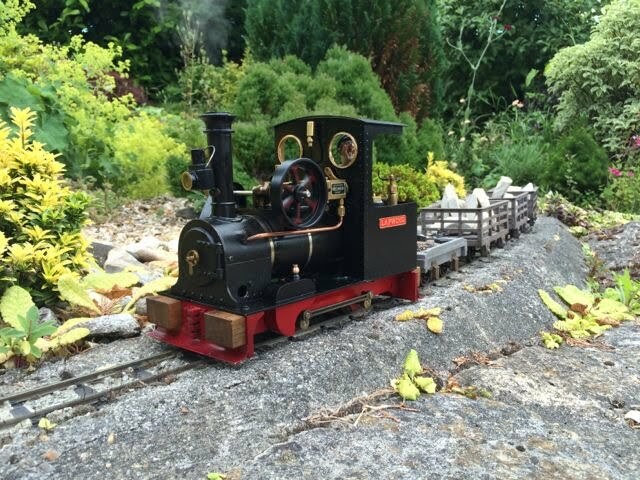 The cab is simply bolted on, but to free it, you need to lift the boiler off the footplate. This sounds complex, but it is pretty easy. Just undo the gas pipe and remove the chain. Then invert the loco and find the two small nuts holding the boiler in place. Remove these and the boiler comes off cleanly. Remember where the spacers go and put all the parts somewhere safe! Here is the footplate showing the slots where the fixing bolts pass through. When reassembling make sure it is central! Now I was lucky enough to have a sheet of 0.8mm brass that a late friend had started to make into a cab. The cut out for the boiler was there, and two small spectacle holes, but the rest was still just sheet brass. I marked out the width of the cab and cut the sheet into three, using a multi-purpose chop (or mitre) saw. These are pretty violent and it is essential to wear eye protection as you get showered with hot metal. (unless you are 110% confident that you can do it safely, then don't use this method!!). I place the brass on a piece of waste hardwood for cutting. 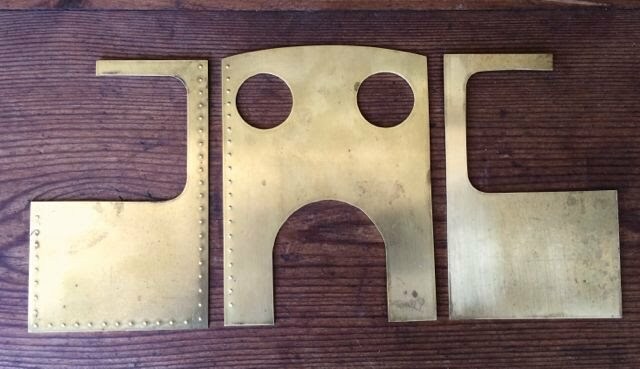 I developed the design directly on to the brass and cut it roughly to shape with the chop saw. I decided on rear entry to the cab as one of the original 'doorways' was blocked by the gas tank anyway and the other was far too small for the 7/8ths driver. To cut the second side, I marked round the first side with felt tip and you can see the chop saw cuts and the chain drilling. Not a pretty sight! In the end I decided to make a rivet embossing tool as designed and written up by Vance Bass in the August 2002 Garden Railways Magazine. This uses a workshop drill press with a specially turned punch. The punch is shouldered at the top to be gripped by the chuck and at the bottom there is a flat shoulder round the punch. The punch has a diameter of the rivet, minus twice the metal thickness. The length is the radius of the rivet if you want it hemispherical. I used a bit less. For thick brass like my 0.8mm it is nearly pointed. The 'female is simple two holes, the size of the desired rivet, at the correct spacing. They are positioned the correct distance from a 'fence' to hold the alignment. The clever bit is that the shoulder on the punch never lets it go too deep and by moving the first rivet to the second hole, you always get the correct spacing. Here is the result of a few minutes work - but it pays to plan exactly where you want them to start and stop and set your 'female hole spacing accordingly. Needless to say, I didn't! And here I have added sturdy handrails. Note that I put rivets down the handrail edge where I didn't want them and forgot them along the bottom where I did! Small pieces of heavy gauge brass angle were soldered to the bottom of the cab and threaded 8BA to take fixing bolts. The original side steps were removed. The roof was bent up from a piece of the 0.8mm brass with locating angles soldered underneath. It just lifts off. I turned the spectacles from a brass water pipe fitting and they just press in. Painting followed my usual method. I did, however spray the inside with a matt cream (an etch primer bought from Ebay years ago) and then masked this to spray the black. I made a dummy whistle to fit on the brass rod, soldered to the cab front, but no sooner finished it than I lost it in the workshop. My eye fell on a prototype SCGP10 Chuffer made for tiny chimneys. It looks pretty good I think - and, of course, the dummy one showed up after hiding in plain sight. Name plates are off the shelf from John Lythgoe - and no, the reverser was not fitted in these photos. Oh yes - and it is off the rails too! In fact, when I got Vincent running properly, I needed to raise the 'slate' (or rather 'moss') scrapers by bending them with a block of wood. Now I am not one for weathering locos, but this really was a bit shiny - especially the red bits. After thorough degreasing, I mixed up some black and brown acrylic paint with matt varnish and then diluted it with water and bioethanol for airbrushing. I applied a lot of thin coats to the beams and frames, just to take the shine off. The trouble is that it does scratch fairly easily. I should have guessed that the chain guard would make the lubricator drain incredibly hard to access - especially as it has to come right out. I drilled a 1mm hole up the centre of the threaded part and then cross drilled it to one side. I now only needs to turn just over half a turn to drain the water - and is very effective if there is a little steam pressure left. It needs a drip tray though. This is fitted to the SCGP1 Chuffer which just needs a little crimping on to the exhaust, It allws control of the chuff and steam plume. One of my favourites - showing Vincent with my Roundhouse based Betty.